Manchester is the largest city in the U.S. state of New Hampshire, the tenth largest city in New England, and the largest city in northern New England, an area comprising the states of Maine, New Hampshire, and Vermont. It was first named by the merchant and inventor Samuel Blodget (after whom the Samuel Blodget Park in Manchester North is named). Blodget's vision was to create a great industrial center similar to that of Manchester in England, which was the world's first industrialized city. 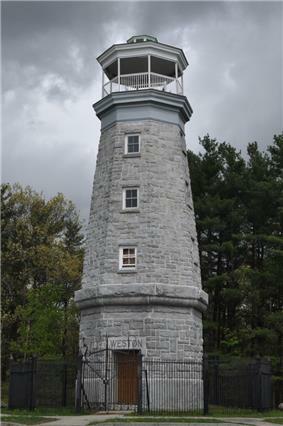 It is located in Hillsborough County along the banks of the Merrimack River, which divides the city into eastern and western sections. Manchester is near the northern end of the Northeast megalopolis. As of the 2010 census, the city had a population of 109,565, and its 2014 population estimate was 110,448. As of the 2014 population estimate, Manchester is the largest New England city north of Boston, including other Massachusetts cities. 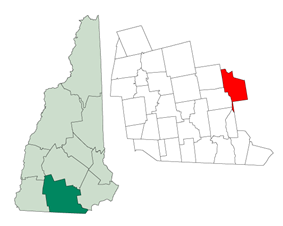 The Manchester-Nashua metropolitan area, with an estimated population in 2014 of 405,184, is home to nearly one-third of the population of New Hampshire. Pennacook Indians called it Namoskeag, meaning "good fishing place"—a reference to the Amoskeag Falls in the Merrimack River. In 1722, John Goffe III settled beside Cohas Brook, later building a dam and sawmill at what was dubbed Old Harry's Town. It was granted by Massachusetts in 1727 as Tyngstown to veterans of Queen Anne's War who served in 1703 under Captain William Tyng. But at New Hampshire's 1741 separation from Massachusetts, the grant was ruled invalid and substituted with Wilton, Maine, so Governor Benning Wentworth rechartered the town in 1751 as Derryfield. Derryfield remains a neighborhood in contemporary Manchester, along its easternmost area adjacent to Massabesic Lake. Manchester is nicknamed the Queen City, as well as the more recently coined "Manch Vegas". In 1998, Manchester was named the "Number One Small City in the East" by Money magazine. The Mall of New Hampshire, on Manchester's southern fringe near the intersection of Interstates 93 and 293, is the city's main retail center. In 2001, the Verizon Wireless Arena, a venue seating more than 10,000, opened for major concerts and sporting events, enhancing the city's downtown revitalization efforts with a major hotel and convention center already in place directly across the street from the arena. Northeast Bedford – The northeast section of Bedford is a mainly low to mid-density suburban residential area near the terminus of the of former St. Joseph's streetcar line along Donald Street and post-war development along Boynton Street, with some businesses scattered throughout. 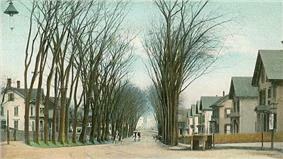 The area does not have a formal name, but the section along Boynton Street has variously been called the Plains and the Pines. The northern area is more rural with large portions owned by Saint Anselm College. Manchester has a four-season humid continental climate (Köppen Dfa), with long, cold, snowy winters, and very warm and somewhat humid summers; spring and fall in between are crisp and relatively brief transitions. The monthly daily average temperature ranges from 24.4 °F (−4.2 °C) in January to 72.5 °F (22.5 °C) in July. On average, there are 11 days of 90 °F (32 °C)+ highs and 22.9 days of sub-0 °F (−18 °C) lows. Precipitation is well-spread throughout the year, though winter is the driest while March tends to be the wettest. Snowfall, the heaviest of which is typically delivered through nor'easters, averages around 47 inches (119 cm) per season, but varies widely from year to year. Manchester's population at the 2010 census was 109,565. 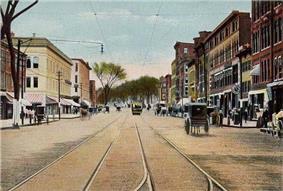 The city is the center of the Manchester, New Hampshire, New England City and Town Metropolitan Area (NECTA MA), which had a population of 187,596 as of the 2010 census. As of the census of 2010, there were 109,565 people, 45,766 households, and 26,066 families residing in the city. The population density was 3,320.2 people per square mile (1,281.5/km²). There were 49,288 housing units at an average density of 1,493.6 per square mile (576.5/km²). The racial makeup of the city was 86.1% White, 4.1% Black or African American, 0.30% Native American, 3.7% Asian, 0.1% Pacific Islander, 3.1% from some other race, and 2.7% from two or more races. Hispanic or Latino of any race were 8.1% of the population. Non-Hispanic Whites were 82.0% of the population, down from 98.0% in 1980. In the city the population was spread out with 21.6% under the age of 18, 10.2% from 18 to 24, 30.4% from 25 to 44, 26.0% from 45 to 64, and 11.8% who were 65 years of age or older. The median age was 36.0 years. For every 100 females there were 98.5 males. For every 100 females age 18 and over, there were 96.6 males. Manchester is northern New England's largest city, and as of the 2014 U.S. Census population estimate was the most populous New England city north of Boston, including other Massachusetts cities. 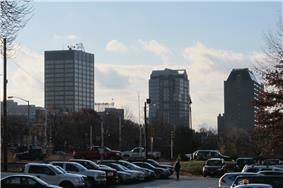 Its metropolitan area is one of the fastest growing in New England. Its economy has changed greatly, as Manchester was a textile mill town about 40 years ago. In March 2009 Kiplinger voted Manchester the second most tax friendly city in America, after Anchorage, Alaska. Earlier in the year, CNN rated Manchester 13th in its 100 best places to live and launch a business in America. Manchester is the home of Segway, Inc., manufacturers of a two-wheeled, self-balancing electric vehicle invented by Dean Kamen. Downtown Manchester's One City Hall Plaza and the all-black Hampshire Plaza stand 20 stories high and are the tallest New England buildings north of Cambridge, Massachusetts. The Hampshire Plaza is shorter than City Hall Plaza by a mere 16 feet (4.9 m). 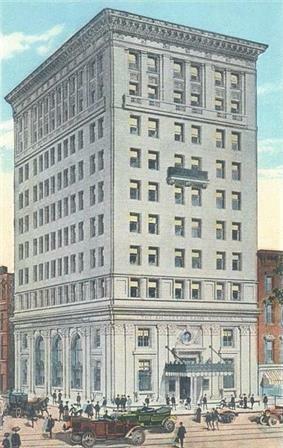 Other major buildings include the 13-story New Hampshire Tower; the Amoskeag Bank Building, (which now houses Citizens Bank); and the former Carpenter Hotel. 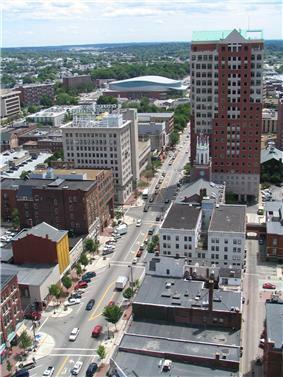 The Verizon Wireless Arena has become the centerpiece of downtown Manchester. The venue can seat slightly less than 12,000 patrons for concerts, and at least 10,000-seat configurations for sporting and other forms of entertainment. The Verizon was formerly home to the Manchester Monarchs, the local AHL affiliate of the Los Angeles Kings. It has also hosted major recording artists and comedians, national touring theatrical productions, family-oriented shows, and fairs since it opened in 2001. The Northeast Delta Dental Stadium (formerly MerchantsAuto.com Stadium) is a baseball park located on the Merrimack River in downtown Manchester and is home to the local AA baseball affiliate of the Toronto Blue Jays, the New Hampshire Fisher Cats. Historic Gill Stadium supported professional minor-league baseball into the early 21st century and continues to be a viable and popular downtown venue for many sporting and entertainment events, seating nearly 4,000 patrons, depending on the event format. 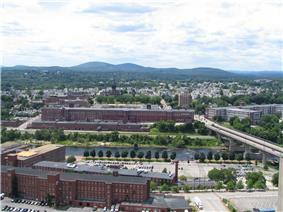 In recent years there has been continual redevelopment of the Amoskeag Millyard and its residential Historic District. The increasing popularity of downtown living has caused many properties originally built as tenement housing for mill workers in the 19th century to be converted to stylish, eclectic residential condominiums. Many new retail stores and higher education institutions, including the University of New Hampshire at Manchester, have been uniquely retro-fitted into properties along Commercial and Canal Street. 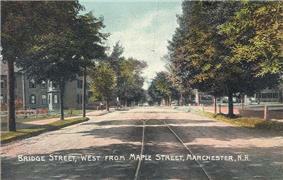 Manchester has three main retail areas: downtown Manchester, South Willow Street (NH Route 28) and Second Street, on the West Side. The Mall of New Hampshire is located on South Willow Street, and, with more than 125 stores, is one of the largest shopping centers in southern New Hampshire and central New England. 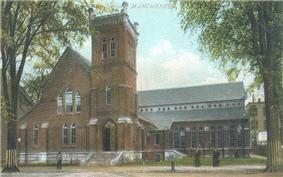 Cultural landmarks include the historic Palace Theatre; the Currier Museum of Art; the New Hampshire Institute of Art; the Franco-American Center; the Manchester Historic Association Millyard Museum; the Massabesic Audubon Center; the Amoskeag Fishways Learning and Visitors Center; the Lawrence L. Lee Scouting Museum and Max I. Silber Library; and the SEE Science Center. Valley Cemetery, the resting place of numerous prominent citizens since 1841, is an early example of a garden-style burial ground. The nickname "ManchVegas" was derived from illegal gambling in local businesses during the late 1980s or early 1990s. Many pizza shops and local bars had video poker machines that would pay out real money. The nickname was coined following a city-wide bust of these machines. It was then adopted as a lampoon of the city's limited entertainment opportunities. The term has since become a source of pride as the city's entertainment scene has grown. By 2003 it was well enough known that a note on Virtualtourist.com said, "Residents reflect the regional dry humor by referring to sedate Manchester as 'ManchVegas'." By 2005, an article in Manchester's Hippo (a local alternative weekly) said that then-Mayor Robert A. Baines "is pushing to replace the nickname ManchVegas with Manchhattan" (meaning Manchester+Manhattan). In 2009 the film Monsters, Marriage and Murder in ManchVegas was released referencing Manchester's popular nickname and using much of the city as its backdrop. Manchester has a growing collective of artists, due in large part to the influx of young students at the New Hampshire Institute of Art, Southern New Hampshire University, and the University of New Hampshire at Manchester. Slam Free or Die, New Hampshire's only weekly slam poetry venue, is located in Manchester and was voted "Best Poetry Venue in the World"  by readers of Write Bloody Publishing. The city is home to McIntyre Ski Area, which opened in the 1970s. There are also college sports teams that play in and out of the city. Manchester is the only city in New Hampshire with professional sports teams. The Verizon Wireless Arena is home to the ECHL's Manchester Monarchs. From 2001 to 2015, Manchester had a team, also called the Manchester Monarchs, that played in the American Hockey League. In their final season in Manchester, the Monarchs won the league championship. Northeast Delta Dental Stadium is home to the two-time Eastern League champions, the New Hampshire Fisher Cats. The following is a list of Manchester's professional and minor-league sports teams. Manchester has several sports leagues. Manchester Angels Youth Soccer League is a spring-only league. All five of these leagues are members of the New Hampshire Soccer Association. Manchester is also home to the Manchester Regional Youth Hockey Association. The Flames, as they are nicknamed, play primarily at the West Side Ice Arena but also have some games and practices at JFK. There are many other youth sports opportunities in Manchester including AAU baseball and basketball as well as CYO basketball. 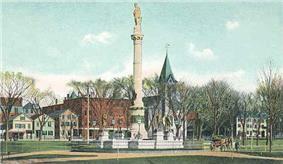 Manchester is incorporated as a city under the laws of the State of New Hampshire, and operates under a strong mayoral form of government. The mayor serves as chairman of the fourteen-member Board of Mayor and Aldermen, the city's legislative body. Each of Manchester's twelve wards elects a single alderman, and two additional at-large members are elected citywide. The mayor also serves as the chair of the board of school committee. Like the board of aldermen, the school board has twelve members elected by ward and two at-large members. The School Board is not a city department; rather, it is a school district coterminous with the city, which obtains financing from the Board of Mayor and Aldermen. 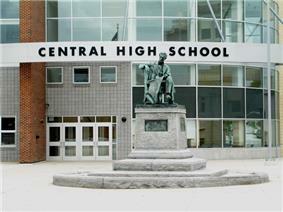 Manchester's public school system is run by the Manchester School District. Manchester School District has four public middle schools and fourteen elementary schools. The Founders Academy, a charter school that debuted in the 2014–15 school year for children in 6th to 12th grades. The city is served by the following newspapers: the New Hampshire Union Leader, The Hippo, and the Manchester Mirror. WMUR-TV Channel 9, the Manchester ABC television affiliate. Manchester Public Television Service Inc, a public, educational, and government access cable television facility. Manchester is on the northern edge of the Boston television market. The city is served by Manchester-Boston Regional Airport, the fourth largest airport in New England. This airport is located off of Brown Ave, and it is the secondary airport serving Boston, Massachusetts. It is used by most of the nation's major airlines, with the largest market share held by Southwest Airlines. Alternative airports include Boston's Logan International Airport and Portland International Jetport in Maine. Interstates 93 and 293 and the F.E. Everett Turnpike are multi-lane highways that connect the metropolitan area to Concord and the White Mountains to the north and Nashua and Boston to the south. NH 101 is a four-lane highway eastbound from Manchester to Hampton Beach, connecting the city with the southeastern part of the state and the seacoast, as well as Maine and the Massachusetts North Shore via Interstate 95. West of Manchester, NH 101 is a two-lane highway serving as the main artery to Keene, the Monadnock region, and other points in southwestern New Hampshire, eventually connecting to NH 9 and the state's border with Vermont. US Route 3 and state routes 28 and 3A also flow through the city. A direct highway access with the airport connects the Everett Turnpike just south of the city with the Manchester-Boston Regional Airport via a Merrimack River-crossing connector road. Public transportation is provided by the Manchester Transit Authority, which runs several bus routes throughout the city and surrounding areas. Concord Trailways and Boston Express run commuter services to Boston and other parts of the state. Vermont Transit Lines (affiliated with Greyhound Lines) has lines to Montreal. In 2008, Boston Express moved to suburb Londonderry, New Hampshire, and now provides only limited service to downtown Manchester. The possibility of Manchester being served by the Capital Corridor, an extension of the MBTA commuter rail from its current terminus in Lowell, Massachusetts, to Concord, which would also include a stop at Manchester-Boston Regional Airport, is being studied by the New Hampshire Rail Transit Authority and New Hampshire Department of Transportation, which have received federal funding for studying and planning the route. The Capital Corridor route is also being studied as a possible future high-speed rail line connecting Montreal and Boston. 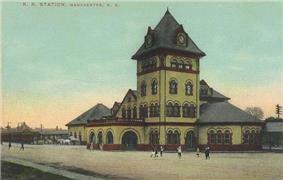 Currently, the Manchester-Nashua area is one of the 40 largest metropolitan areas in the United States without Amtrak service. With the expansion of Interstate 93 to eight lanes from Salem to Manchester under construction, space is being reserved in the median for potential future commuter or light rail service along this corridor. The I-93 transit study also suggested restoring service on the Manchester and Lawrence branch for commuter and freight rail. This corridor would support freight rail along with commuter, something that light rail cannot do. In late 2011, Dean Kamen, famous for inventing the Segway and owner of several buildings in the Millyard, proposed a rail loop for downtown and the Millyard. Several meetings have been held with area business and property owners, city officials and local developers, but the idea is in the early conceptual stages. The downtown rail loop, if approved by the Board of Mayor and Aldermen, would be about three miles long and may be completed sometime around 2017. The loop would go from the Manchester Millyards, down south for about half a mile, then turn over Elm Street, separate into two rails (the other going towards Manchester-Boston Regional Airport), and climb north to Bridge Street and up to the New Hampshire Tower, where it ends. Law enforcement is provided by the Manchester Police Department. 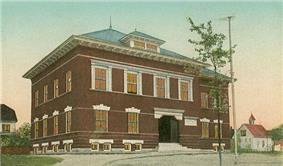 The Manchester police station is currently located at 405 Valley Street on the corner of Valley and Maple. 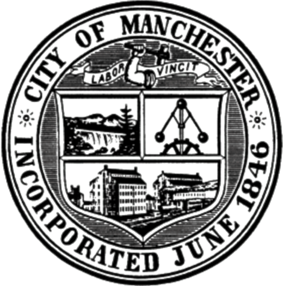 The city of Manchester is protected all year by the 258 paid, professional firefighters of the city of Manchester Fire Department. The department is currently commanded by a Chief of Department, James A. Burkush, two Deputy Chiefs, and five District Chiefs. The Manchester Fire Department currently operates out of ten fire stations, located throughout the city, and operate a fire apparatus fleet of ten engines, five trucks, one rescue, and one district chief (two if manpower permits). 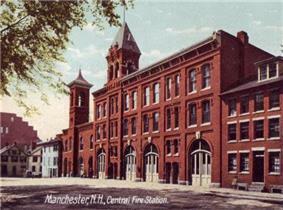 The Manchester Fire Department currently responds to over 18,000 emergency calls annually. Manchester houses the state Roman Catholic Diocese at 153 Ash Street. ^ a b c "Annual Estimates of the Resident Population for Incorporated Places: April 1, 2010 to July 1, 2014—New Hampshire". ^ Manchester, New Hampshire Publisher: CityTownInfo.com Retrieved: 4 March 2014. ^ a b c "Geographic Identifiers: 2010 Demographic Profile Data (G001): Manchester city, New Hampshire". U.S. Census Bureau, American Factfinder. Retrieved August 5, 2014. ^ "Annual Estimates of the Resident Population: April 1, 2010 to July 1, 2014 (PEPANNRES) - United States -- Metropolitan and Micropolitan Statistical Area; and for Puerto Rico". U.S. Census Bureau, American Factfinder. Retrieved September 28, 2015. ^ a b From textiles to high-tech: No. 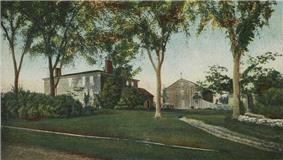 13, Manchester, N.H. - Mar. 26, 2008. Mutualfunds.info (2008-03-26). Retrieved on 2013-08-02. ^ a b "Top 10 Tax-Friendly Cities". Yahoo!. ^ a b c d The Editors of Encyclopædia Britannica (2 December 2014). "Manchester, New Hampshire". Encyclopædia Britannica Online. Encyclopædia Britannica. Retrieved 22 June 2015. ^ a b Samson, Gary (2000). 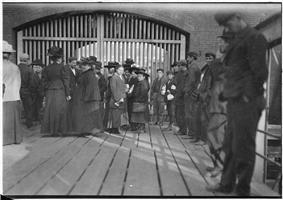 Manchester: The Mills And The Immigrant Experience. Portsmouth, New Hampshire: Arcadia Publishing. pp. 13–18. ^ Samson, Gary (2000). Manchester: The Mills And The Immigrant Experience. Portsmouth, New Hampshire: Arcadia Publishing. pp. 22–27. ^ Master Plan. Manchesternh.gov (2012-02-06). Retrieved on 2013-08-02. ^ City of Manchester : Current Projects. Yourmanchesternh.com (2010-06-30). Retrieved on 2013-08-02. ^ Oh Goodies: Wal-Mart Goes Mail-Order Gourmet | New Hampshire Public Radio. Nhpr.org (2012-11-14). Retrieved on 2013-08-02. ^ Only In Print: Big-dollar facelift is hoped for the Hollow | New Hampshire Only in Print. Unionleader.com (2013-05-26). Retrieved on 2013-08-02. ^ "Station Name: NH MANCHESTER AP". National Oceanic and Atmospheric Administration. Retrieved 2013-03-08. ^ "Climatography of the United States No. 20 (1971–2000)" (PDF). ^ "Monthly Averages for Manchester, NH – Temperature and Precipitation". The Weather Channel. Retrieved 2014-07-07. ^ "Profile of General Population and Housing Characteristics: 2010 Demographic Profile Data, Manchester, NH Metropolitan NECTA". U.S. Census Bureau, American FactFinder. Retrieved September 16, 2011. ^ a b c "Profile of General Population and Housing Characteristics: 2010 Demographic Profile Data, Manchester city, New Hampshire". U.S. Census Bureau, American FactFinder. Retrieved September 16, 2011. ^ "Manchester (city), New Hampshire". State & County QuickFacts. United States Census Bureau. ^ "New Hampshire — Race and Hispanic Origin for Selected Cities and Other Places: Earliest Census to 1990". United States Census Bureau. ^ "Selected Social Characteristics in the United States: 2011 American Community Survey 1-Year Estimates (DP02), Manchester city, New Hampshire". U.S. Census Bureau. Retrieved February 22, 2013. ^ "U.S. Decennial Census". Census.gov. Retrieved April 5, 2013. ^ "Selected Economic Characteristics: 2011 American Community Survey 1-Year Estimates (DP03), Manchester city, New Hampshire". U.S. Census Bureau. Retrieved February 22, 2013. ^ "Manchester Local Customs". VirtualTourist.com. Retrieved June 7, 2010. ^ "Manchester Parks need help". The Hippo. Retrieved June 7, 2010. ^ "SNHU Athletics". Southern New Hampshire University - Official Website. SNHU. Retrieved 29 April 2015. ^ Rivers, Bryon (2009-08-21). The women of Skate Free or Die prepare for final match”. Lawrence Eagle Tribune. Retrieved 2010-02-12. ^ List of major cities in US lacking Amtrak service - WorldHeritage, the free encyclopedia. worldheritage.org. Retrieved on 2013-08-02. ^ Livable: Dean Kamen proposes downtown rail loop. LivableMHT (2012-01-17). Retrieved on 2013-08-02.